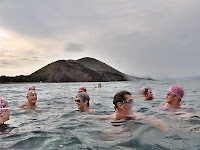 My friends the Maui Pink Cap Swimmers gathered for our weekly ocean swim this morning. The water was clear, but cool, and the swimmers took off with no looking back. I, as usual, brought up the rear and got to swim with a Spotted Eagle Ray and a Manta Ray along with a few of the more playful swimmers. There is a definite benefit to being slow since I often see things nobody else notices. Wow, just like clockwork! I've swum here on Maui with spinner dolphins on November 29th in 2006, 2007 and 2008. I've marked my calendar for next year. Click HERE (or Below) for today's Video. We saw several humpback whales this morning out in the deep water. We didn't get close enough to get any decent photos, but we saw backs, tails and blows. I've been hearing reports of whale activity all week, and could hear them singing underwater a couple of days ago, but this was the first time I've seen them for myself. 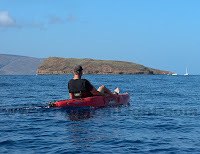 All this thanks to Doug who decided he wanted to kayak to Molokini. 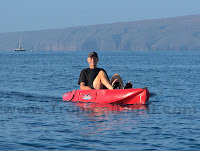 This was the first time I've been in a kayak since spring and Molokini was definitely an island too far. It was a fun ride out, but the return trip was pure agony. Oh, my aching back. 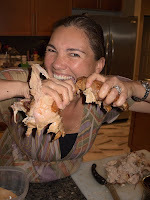 Joelle and Kevin, thank you so much for opening your home to us for Thanksgiving dinner. We had a great time. Joelle (pictured here), you always bring a wonderful element of class to any situation. We are proud to be counted among your friends. The weirdest thing. 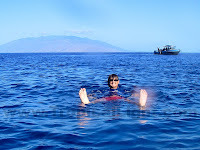 While swimming recently in Makena I noticed a strong sulphur smell in a certain area. 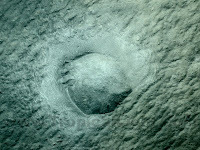 Today in that same area I noticed this place on the ocean floor where the sand had obviously been bubbling up from below. Has the Haleakala volcano become active once again? No time for play today. 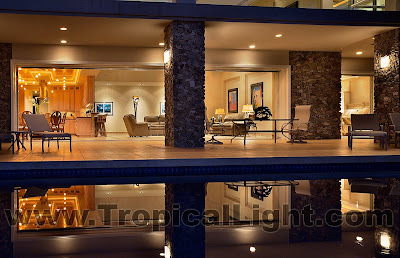 I was photographing a seven bedroom oceanfront home with a master walk-in closet half the size of my house. Yes, this closet could easily contain my bedroom and living room. Despite chilly air and chilly water I went for an ocean swim this morning. 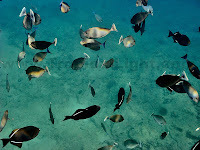 Bruce was out and about, but so were spear fishers looking for both food and sport. Fortunately they decided that Bruce was too big to handle. Last week I watched a stunningly beautiful movie on Blu-Ray called Baraka which had many time-lapse scenes. I've never attempted time-lapse photography, so yesterday I decided to try it out. So here's yesterday's sunset in Makena (click HERE or below for the Video). How could this have happened? It is 85 degrees Fahrenheit, the sun is shining, the ocean water is warm and clear - today is the perfect summer day! 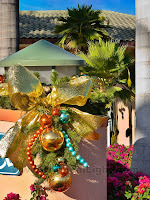 So why are Christmas decorations up at the local shopping center? 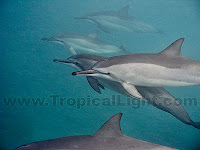 Another gray day greeted a small, but determined, band of Maui Pink Cap Swimmers this morning. The light sprinkling of rain somehow made the ocean seem colder and getting in wasn't easy. One of our new swimmers ran into a coral head while swimming through the Arch. We could all hear the collision (click HERE or below for the Video) and were glad that she only scraped her back and didn't crack her head. Then another first-timer ran into a jellyfish and everyone scrambled for the shore. Well, not the idiots, of course. I kept on swimming. As did Lynne, David, Jonathan and Cheryl. No other major incidents were reported and the sun actually broke through the clouds on our return. Blue skies are back! I saw dolphins splashing offshore this morning as I entered the ocean for my swim. Boats had gathered to observe them, so I swam out deep to the boats. The current was running strong and I never got closer than a hundred yards away. I could see the dolphins leaping just over there... Just out of reach... To anyone who thinks that swimmers could possibly harass dolphins, I say "Pish posh, what nonsense!" Dolphins and whales may choose to approach me, but only if they are interested. With a single flick of their tail they easily shoot away. Lynne got her birthday wish and danced with Spinner Dolphins this morning. 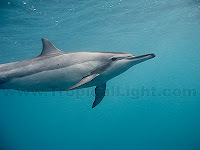 She is one of the younger Maui Pink Cap Swimmers and loves to dance with dolphins. 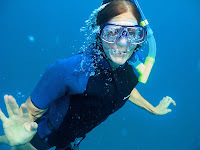 I was lucky enough to be included in her ocean swim, and got a little bit of video and a few still photos (Click HERE or Below for Today's Video). Enjoy! 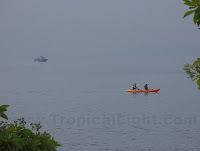 Cloudy skies, cloudy water, a bit of rain - this is South Maui? Even many of the die-hard swimmers were so unnerved that they turned around early and headed for shore. Me? I kept going and managed a good workout, not very interesting, but strenuous nonetheless. My new friend, Amy, talked me into an ocean swim this morning down at La Perouse bay. The clear water was a glorious improvement over yesterday's murk around Pu'u Ola'i. Thanks, Amy. I was nervous swimming in murky water this morning. 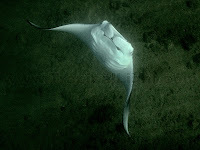 It didn't help when this big white thing with a large open mouth headed toward me from out of the depths. 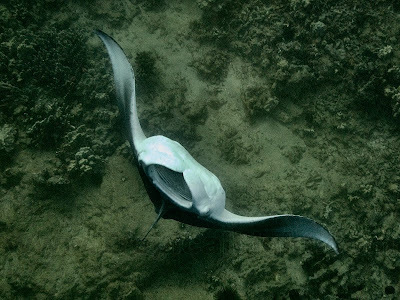 Whew, just a manta ray. It was feeding on all of the organic debris in the water, swimming loops to gather as much as possible from each rich location. (Click HERE (or Below) for today's Video) I hung with it for a few minutes, then, with a flick of its wings, it was gone. Vanished into the gloom. I decided I didn't want to suddenly encounter any other large creatures, so I cut my swim short and headed back to shore. Words fail me today. So here's a photo I took this morning. 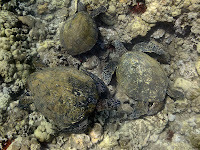 I watched two big males fighting over this small three-legged turtle this morning. Well, it wasn't exactly Fight Club. 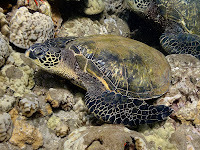 The smaller male would swim up to the bigger one until they bumped shells. 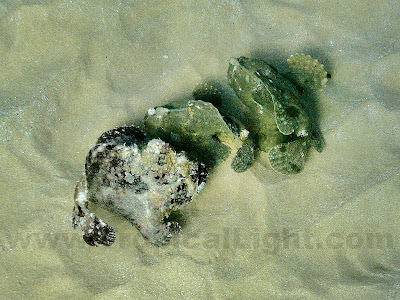 Then they would lightly nip each other on the neck and the smaller one would casually swim away. Most of the time the smaller one would try to burrow under the larger one, I guess it was trying to dislodge it from it's resting place. 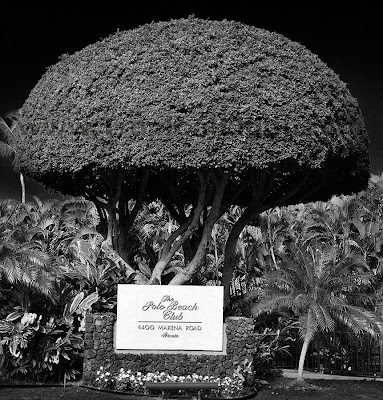 All in all a very laid-back Maui kind of conflict. Several keiki were surfing at the Cove in Kihei this morning. I wouldn't have noticed except that as I walked past, a boy smaller than this guy was casually riding a wave facing backward. He seemed to be looking for the next and bigger wave rather than appreciating the one he was on. This bird was making itself at home on my neighbor's pool deck. At first it looked like a domestic duck, but it had a beak with a hook at the end instead of a flat bill. It also had claws at the end of each webbed toe. 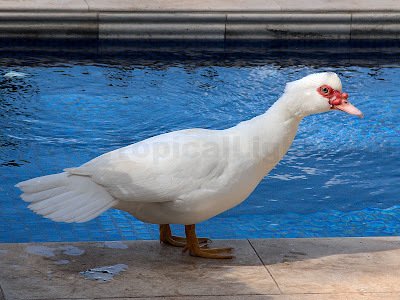 What you found here is a Female Mascovey Duck. 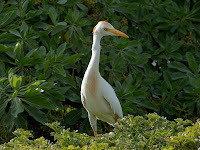 It is originally from Southern Texas but has a growing population here in Hawaii. 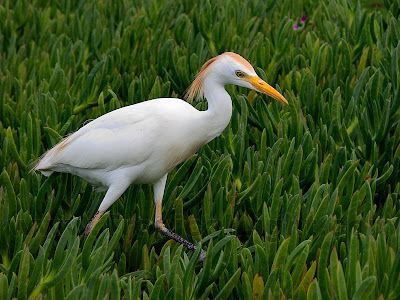 They are quite common as pets since they are pretty social and only the females are able to fly. Hope this helps. Please fell free to email any time. I don't swim in murky water. 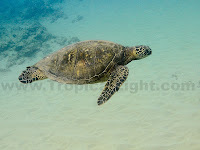 The visibility was poor today, but I found if I kept to the deep water then it was clear enough for me. The trick, of course, is getting to the deep water. Our Sunday swim group started small and dwindled as the passage out to the deeper water progressed. Eight brave souls persevered and were rewarded with a good workout. 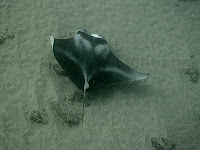 On our way back, barely visible through the cloudy water, Kevin and Suzanne found this manta ray zooming along the bottom. It seemed to be happily eating whatever it was that was obscuring our vision. Keep up the good eating, manta! Spinner dolphins have been roaming up and down the shore the past couple of weeks. Somehow I kept missing them, until this morning. They made a few close passes to check me out - good thing because the water has been rather murky and I would never have seen them otherwise. It seemed to be a big group, but I couldn't get a count the way they became invisible more than ten yards away. Who knows, maybe they will swing by and visit the Pink Cap Swimmers tomorrow morning. I watched the most bizarre trio of fish wiggle their way across the ocean bottom this morning. Each time I approached with my camera, they would stop and gather tightly together. 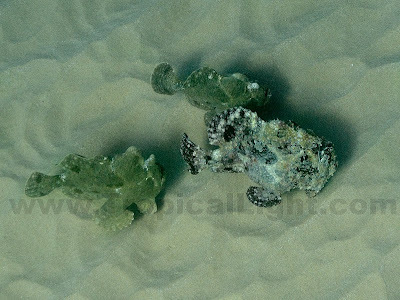 According to Wikipedia they appear to be Frogfish. Even though I can't see it in the photos, they are supposed to have a thin spine between their eyes from which dangles a fishing lure right in front of their mouths. It's a good thing I don't have one of those lures, I know for sure that I would be constantly chasing it. 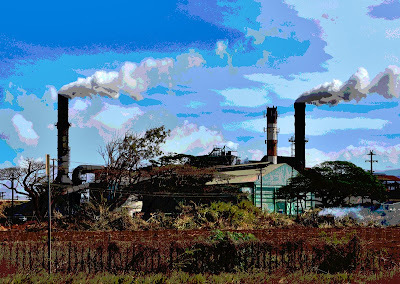 I photograph many of the most beautiful homes in Hawaii, but the one today stands apart. Yes, the ceiling trim, door moldings and baseboard are limestone. Yes, the art on the wall is carved limestone. Yes, the tub is a granite boulder cut in half, carved out and polished smooth inside. It has a single hole cut in the bottom as a drain and is filled by water which falls from the ceiling. And this is only one of the many, many unique rooms in this amazing home. Yesterday I met a charming couple from Indianapolis at the beach and we chatted for a while. As we were talking a light suddenly went on for one of them and he said, "You're Maui Don, aren't you?" He told me that during the past few months whenever he would get discouraged, he would go to my blog and get all excited about their upcoming trip to Maui. I am finding it difficult to concentrate on work with election results playing in the other room. It was great getting out into the ocean earlier today, away from TV, radio and the internet. Personally, I'm not thrilled with either presidential candidate; I'll keep on swimming calmly along no matter which way things turn out. 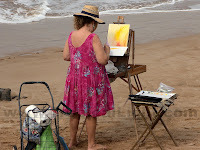 Art is alive and well on Maui. 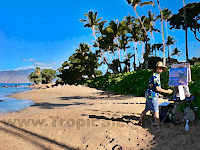 This morning on my walk I passed two artists working to capture the beauty of Maui's south coastline. I stopped briefly to speak with each of them, and each had business cards and web sites. I featured Jim Freeheart (top photo) in an earlier blog post (click HERE for that post). 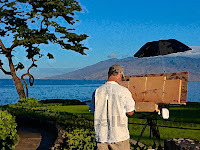 His work is boldly colorfully impressionistic (click HERE for his web site). 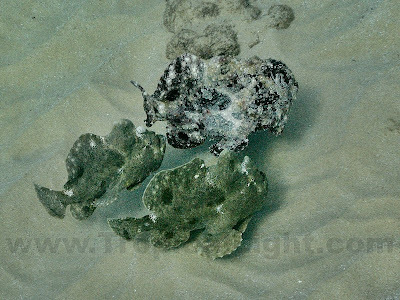 An artist who I have not before noticed on the beach is Ken Kennell (click HERE for his web site). His style is pointillistic and far more subtle than Jim Freeheart's. 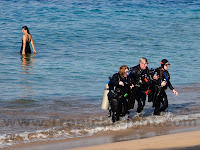 The Maui Pink Cap Swimmers seemed to be in a hurry this morning, but in a hurry to get where? With the group's most potent socializers all off island, stopping and chatting wasn't an option. Neither, it seemed, was stopping and playing. Still, I got some great exercise. Click HERE (or Below) for a short video of today's swim. 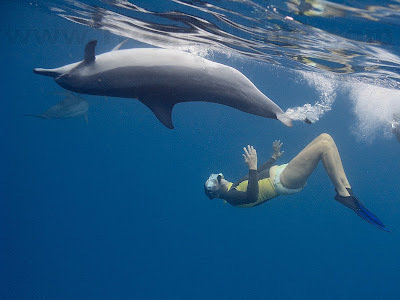 One great thing about living on Maui is being able to swim with people who are even more passionate about swimming with dolphins and whales than I am. Hard to imagine, isn't it? Nancy and Jeff love dolphins and whales and manage to visit them often, work permitting. Somehow they even dragged me out into the ocean on this gray rainy morning. There wasn't much wildlife out there but we had fun blowing bubble rings and splashing about. Amazingly, Nancy did the impossible and got me to pose for a photograph. I'm still not sure how she tricked me into getting on the wrong side of the camera. Never again!